Nicholson Construction was recently named the Design/Build General Contractor for the Prairie du Sac Dam remediation project, located near Madison, WI. 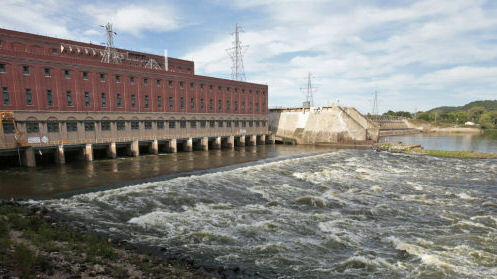 The dam has operated on the Wisconsin River for the last 105 years. Over the period of its operation, the tail waters have decreased significantly, exposing the original wooden timbers and making them susceptible to deterioration. Due to this irreversible condition, a long-term support solution including micropiles drilled through the dam was designed. Nicholson was awarded the full contract for the remediation work, after successfully completing the design phase and a rigorous test program. Alliant Energy named Nicholson the General Contractor for the project, with a scope of work that includes the installation of close to 1,000 micropiles 250 threaded bar pier anchors, 1,274 cubic yards of excavation within the gallery and construction of a 1,394 linear-foot concrete transfer beam. The project is restricted to the working months of July through November due to weather conditions and river levels. Nicholson’s portion of the work will be completed by December 2020.